We have developed a separate unit for keeping a large stock. This unit is managed and maintained by our adroit professionals and fulfills the ever-growing needs of the clients. We are from Ahmedabad(India) and engaged in catering to the market with quality products at nominal prices. 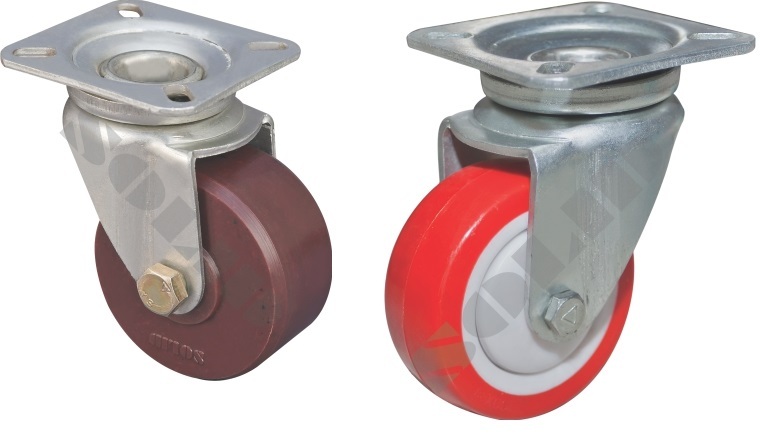 Plate Type Caster : Pressed Steel Swivel Caster having No king pin duly bright Zinc plated, double ball race in Swivel head. Robust construction and completely integrated sealed system which eliminate problem of balls coming out of the castor. PPCP (CP) Wheel : Poly Propylene Co-Polymer (CP) wheel made by injection moulding technique under controlled temperature and pressure. No effect of acid and alkaline chemicals. PU ON PPCP Wheels : Poly-Urethane Wheels having PUCP center with double ball bearings / Wheels made by injection moulding process. PU Hardness 85 Shore A and 75 Shore A scale. Non-marking , smooth & silence.